Once the bastion of airlines and credit cards, rewards programs have expanded to the point where it is now possible to be “rewarded” for buying everything from a pack of gum to a brand-new car. Every retail checkout clerk is trained to ask, at every visit, if you would like to join the store’s rewards program. Merely sharing your email address can result in a bombardment of messages promising points, rewards, and other inducements. Rewards programs were designed to drive loyalty and repeat purchase behavior. Originally introduced by the airline industry in the late 1970s and early 1980s, frequent flyer programs were actually successful in driving consumer preference. However, as competition entered the market and consumers signed up for multiple programs, they became more agnostic about which airline to fly. In response, airlines upped rewards and collaborated with credit card companies to offer additional incentives. But soon the surfeit of rewards points became a bloat on the airlines’ balance sheets — every unredeemed point had a dollar value, after all. And consumers would grow angry when the airlines blocked them from redeeming the points for upgraded seats or free tickets on desirable dates. The evolution has led to some serious questions about rewards programs. Do they actually drive the intended repeat purchase behavior and brand loyalty ? Or have they simply become a costly balance-sheet liability, rendered irrelevant in the market by a competitive environment filled with me-too programs? For most consumers, it is the latter, for three reasons. First, incentive schemes provide no point of perceivable difference at purchase, making the points and the brand a commodity. Second, because they are sold on a promise that fails at delivery — a cardinal sin for any brand — they actually provide a disincentive to consumers. And third, they don’t empower the consumer, who may find he is amassing points to spend them on things he doesn’t need, or unable to access the points for offers he might actually want. To understand why, you have to go back to Psychology 101 — specifically to the concept of “operant conditioning,” also known as reward–response. Pioneering psychologist B.F. Skinner required subjects to be placed in a “Skinner box.” The box allowed Skinner to control the stimuli that a subject was exposed to and ensure that the program of rewards would establish the operant conditioning. Unfortunately for most marketers, consumers can’t be contained in Skinner boxes — aka an environment where the product would have a monopoly. But even if they could, the operant conditioning of reward–response doesn’t quite achieve its objective of repeat behavior and consumer preference. A program might be successful at first. But as soon as other competitors enter the mix, the conditioned behavior is no longer operative, because rewards are no longer unique and the environment is no longer controlled. Instead of behavioral conditioning, companies get balance-sheet liability and consumers are bombarded with offers and emails. Worst of all, consumers may come to expect rewards for doing nothing. To a degree, then, traditional rewards programs are a waste of corporate money. But they don’t have to be. Let’s return to the lab. One of the findings of operant conditioning was that random rewards are more effective than predictable ones. A dolphin that receives a tasty fish every time it leaps from the pool will soon become disinterested in jumping. Reward her at random, however, and she will soon jump with enthusiasm for she never knows which jump will merit the treat. 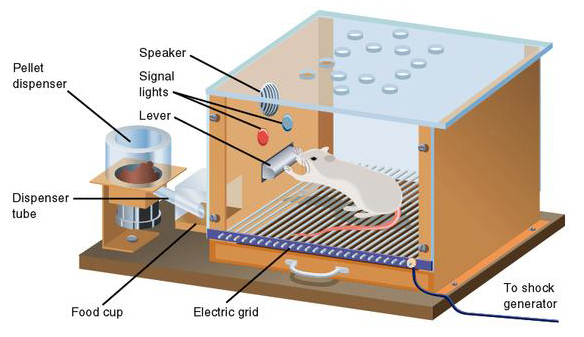 When the mice pushed the lever in the Skinner box and always received the reward, they soon demonstrated fatigue with the game and stopped pushing the lever. They knew the reward would always be there. But when scientists rewarded the mice intermittently, the mice pushed the lever with increased frequency. Unable to predict when they would receive a prize, and reluctant to miss out on one, they pressed the lever obsessively. Right or wrong, intermittent variable rewards are powerful tools in manipulating behavior — and therefore ideal for marketing programs. Some analysts claim our obsession with social media and our addiction to mobile devices stand as evidence of the intermittent reward effect: We click compulsively on email and Twitter, not because we are certain we will be rewarded with interesting messages, but because we might be. Thus the intermittent reward conditioning is reinforced. Applying behavioral science to rewards programs would have the same effect. So how should a marketer change rewards programs? These three steps will be useful. 1. Start by eliminating rewards for every behavior or purchase. Instead of giving the “mouse” a treat for every lever push, design the program so that the rewards are intermittent — and unexpected. Banks are pretty awful at delighting customers; imagine what might happen if the next time a customer went to an ATM, the machine spit out an extra $20 with a message that read, “Thank you for being our customer!” Or what if a customer went to the checkout counter at a retailer and was told his purchase that day was free? Again, if the reward is intermittent, and it happens often enough, it will absolutely drive repeat purchase behavior and loyalty — because the customer won’t risk missing the one time the reward “hits.” Clearly, casinos have figured out operant conditioning. Imagine what might happen if the next time a customer went to an ATM, the machine spit out an extra $20. 2. Eliminate “points” altogether and replace them with real rewards. Rewards that are intangible (such as points) or that require some herculean effort to amass and redeem cause consumers to become discouraged and skeptical of ever receiving a reward for their loyal patronage. If you need 150,000 miles for a free flight, the prospect of earning 750 on a single leg won’t be much of an incentive to choose one airline over another. Tangible rewards, particularly immediate ones, are far better at driving repeat behavior and consumer preference. One airline that has clearly figured out how to make its rewards have real value is Air New Zealand. Points are expressed as dollars and equal a dollar, and the dollars can be used like real ones to buy seats on any plane. The airline even allows you to redeem their points dollar for dollar for real currency. 3. Give your most loyal customers surprising rewards. The public relations value alone of such rewards – the big jackpot at a slot machine, a free meal when the check is presented, a surprising upgrade to business class — would more than pay for their cost. Most companies treat new customers to wonderful signup bonuses, but are almost neglectful of the loyal customers who have stayed with them for years. Credit card companies will give you 50,000 miles for opening a new credit card, but don’t dare ask them to forgive a late payment after you’ve been a loyal customer for years. Imagine if, instead of refusing, the customer service rep said, “Of course! You’ve been a great customer that not only am I going to remove the late fee, I’m also going to send you a $150 gift card to thank you for being with us for all these years.” Would that customer ever switch to another provider? Real rewards and real rewards programs may seem expensive. But I suspect that too many of today’s standard rewards programs have themselves become too costly — not just in terms of the balance sheet, but also in terms of human capital and marketing program costs. Most rewards programs simply do not work, and should either be redesigned or eliminated completely.